Cree is the most widely spoken Native American tongue in Canada, with nearly 100,000 speakers spread from Quebec in the East to Alberta in the West. Like most indigenous languages, it has a great many dialects, with one group usually being able to understand neighboring dialects, but probably not those far away. Cree is not usually written in Roman characters, but has a syllabic alphabet developed by Methodist missionary James Evans in the 1840's. The characters in this writing system typically stand for a consonant followed by a vowel (e. g., chi, ki, mi, ni, etc.). It proved very simple to use, and contributed to near-universal literacy among the Cree in a short amount of time. There are two variations: one used in the East (Ontario & Quebec) and one in the West (Manitoba, Saskatchewan, Alberta). The Book of Common Prayer was first translated into Cree in the 1850's and has gone through about a dozen editions in three main dialects covering Northern Ontario and Quebec. Nearly all of these were printed in Cree syllabic. The edition used here was translated by Bishop John Horden (1828-1893). The dialect used is Moose Cree, from the area around Moosonee, Ont., but should be similar to that spoken in most of Northern Ontario. This edition was first printed in 1889 with this particular printing dating from 1949; it is, of course, a translation of the English 1662 Book of Common Prayer. It contains all of the BCP save the front matter, the Ordinal, the Articles of Religion, and a few of the lesser-used services. Occasionally some rubrics are omitted also. It appears in David Griffiths' Bibliography of the Book of Common Prayer as 23:3. An earlier (1902) printing of this book is available from Google Books as PDF graphics. A translation into Eastern or Swampy Cree (spoken in Western Ontario) is available from the Internet Archive in PDF. This translation is in both syllabic and Latin type, on facing pages, and was published in 1917 (Griffiths 21:7). 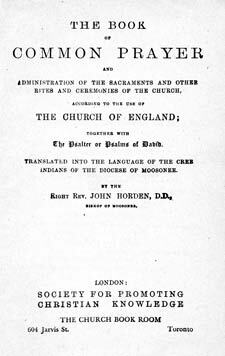 The first Eastern Cree translation (1855; Griffiths 21:1), in Latin type, is available from Google Books. Another translation by J. Hunter (1884; Griffiths 21:3b, syllabic type) is available from the Internet Archive.